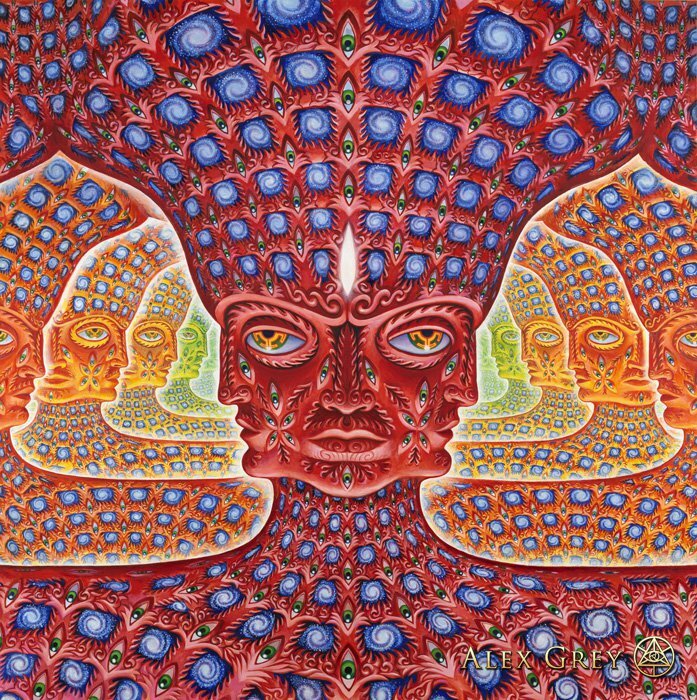 Alex Grey, Visionary artist and co-founder of the highly anticipated Hudson Valley retreat centre, Entheon, gives insight into the central role of travel and spirituality in his work. Rowena Bahl: What does the word ‘divine’ mean to you and why do you think there is such a strong interest in the divine? 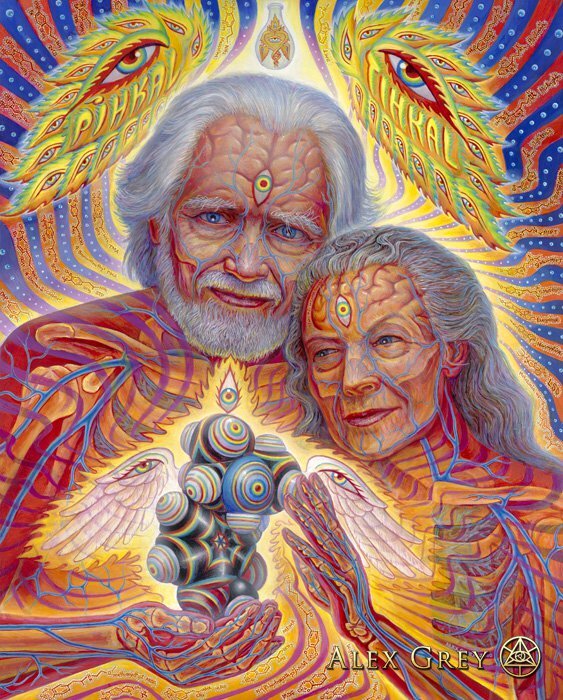 Alex Grey: ‘Divine’ is another name for sacredness; the radiance, beauty, truth and goodness of God; the infinite love and cosmic intelligence of evolutionary creativity. We are drawn to the divine because it is our true nature, our own living centre of consciousness. Christ said, “The kingdom of Heaven is within.” The only place we will ever see God is in the divine imagination during the mystical experience, where the normal boundaries around our self-image begin to dissolve into a vast expanse of compassionate unity with all beings and things. Mohammad said, “To know oneself is to know Allah.” The oneself — the godself — is the transcendental witnessing presence alive in us, as us. The manifest world is a theophany, an appearance of God. Nature is sacred and everything is connected. We are each nodes of the infinite divine being of the cosmos. Some are strongly attracted to the godly because they have had a mystical experience characterised by an overwhelming feeling of unity, of transcendence of space and time. It was positive and ineffable, noetic and paradoxical, and they understand it to be profoundly meaningful. That experience is sometimes reported by meditators, those having had a near-death episode, and especially among those who have taken sacramental substances like psilocybin, LSD, cannabis and aayahuasca. Recent scientific studies at Johns Hopkins University have confirmed that 65 percent of those who ingest psilocybin with sacred intentions and a conducive mindset and setting will have a full-blown mystical experience. These studies on experimental mysticism are the closest science has come to confirming the existence of God. Rowena: Alex, your artwork details the physical, mental and spiritual anatomy of the self. How does your work deal with the flow of influence between the internal world and the external world? Alex: To express the balance between the inner and outer worlds, I interweave symbols of the perspectival structure of space with a map of the anatomical body, integrating figure and ground through webs of psychic energy. Updating the integration of the light body into Western art, I [also] integrate Eastern models like acupuncture, Chi and Yoga — part of the universal cartography of the transpersonal self. This merging of anatomy with maps of subtle energy entered my paintings in 1978, at age 24. 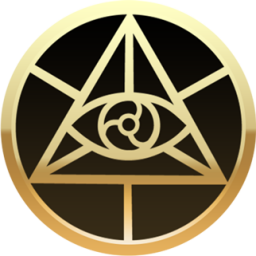 Consciousness has no form, so I’ve created symbols, like a flaming eye to describe ‘luminous awareness’. Many have felt and perceived healing energies zipping through the body. We are a microcosm of a holy macrocosm; we are anthropocosmic, a universe created in our own image. Identifing with the cosmic aspect of the self, we dislodge our ego — even momentarily — from fear and the husk of the temporary body, and experience life as an inextinguishable flame of love. In art, we look for a sacred mirror. We yearn to see the profound timelessness of our soul, a reflection of our godself in a ‘net of being’. A friend’s smile, the dawn, or a beautiful work of art can evoke this realisation. Rowena: Your artwork merges art and science, subjects that have historically been considered somewhat antithetical. How do you see your paintings contributing to a reframing of these two regions of inquiry? Alex: Leonardo da Vinci was immersed in a fusion of science and art. He dissected the body and world as expression of God’s glory. Intense materialism in post-modernity blinds and retards us to ‘spiritual awakening’ potentiated in nature. With this unconsciousness, humanity proceeds to destroy its only home. Visionary Art uses the material world tools of calculation and science to map dimensions of transcendental reality known to mystics. A new worldview is possible when a critical mass envisions the integration of all dimensions of reality. Rowena: How much of your artwork has been inspired by your travels? Is there any destination in particular that changed your perception of the physical and spiritual realms and their connectedness? Alex: With an open mind, travel can be synonymous with new knowledge that influences your creative life. Pilgrimages to extraordinary places around the world, with my best friend, wife and partner of 40 years — the artist Allyson Grey — have been the treasure of my life. From the pyramids and Temples of Egypt and of Mexico, from Sao Paulo to the Holy Lands of Israel, from St. Basil’s onion domes in Moscow to Paracelsus’s alchemical laboratory in Basel Switzerland, to our eyes trained on a total solar eclipse in Australia for a private audience of only 10,000 people on Earth… these [experiences] are unforgettable. We seek out the holy gathering places, the greatest art, temples, and museums dedicated to individual artists like the Ernst Fuchs Museum in Vienna or H.R. Giger’s art-filled castle in Gruyere, Switzerland. Wherever we go we find sacred sites, like visiting the grave of Marie Leveaux, ‘Voodoo Queen’ in New Orleans or taking our sketchbooks to the Sistine Chapel and staying until they kicked us out. All of the holy places tenderise the soul, they open us to the divine. One of my most beautiful remembrances was circumambulating the largest Buddhist temple on earth, Borobudur in Java: ascending level by level, following the relief murals from lower worlds of crimes and passions, to the higher Buddha realms. Active temple grounds retain their spirit fire. Rowena: Tell us a bit about your experiences in Brazil, in particular your exploration of the world of ayahuasca. Alex: Allyson and I have been to Brazil several times. On two occasions at the Tribe Festival outside of Sao Paulo, 25,000 people attended and could watch us for a marathon twenty hours as we painted a 32 foot mural together called Star Dancers. Brazilian festivals can be very huge and exciting. Brazil has always been famous for huge celebrations, like the Carnival, which I got to experience in Manaus. There is a lot of drinking and revelry, festival floats and exotic dress. The various ayahuasca churches of Brazil are one of the most important religious movements occurring on the planet today. Santo Daime in its various forms has been spreading to practically every continent, but by far I prefer the independent shamanic small retreat centres for self-exploration with ayahuasca. We have experienced ayahuasca at centres nestled in the Brazilian jungle. In Manaus, accommodations were very rustic. A Florianopolis retreat centre was intimate and homey, with delicious pescatarian food. Physical comforts become superfluous, whereas the inner journey can be life-defining and ultimate. Rowena: How do these substances work to open particular ways of seeing that we cannot usually access, and how does this process influence your art? Alex: The truth is that no one understands how the sacraments work. You can say that dimethyltryptamine docks on a 5 HT receptor site in the brain, but how does that add up to seeing God 65 percent of the time you do psychedelics? Once you have ‘seen God’, then it becomes your secret gift. How will you share your gift, your light for the world? By definition, these experiences are beyond words. 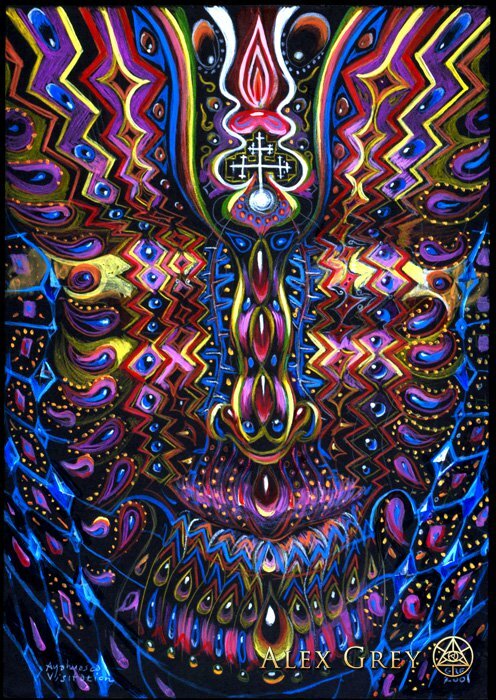 Visionary Art is a primordial language of symbolism that transcends words and is directly influenced by the artists’ mystical experiences from sacramental substances. Allyson and I take sacraments with the intention to remember and “be a faithful witness of Heaven,” and apply that inspiration in our art. Seeking an image, it often ‘calls on me’ within an experience. Some works of art are delivered while in a very natural state. The World Soul sculpture, a 273 kilogramme bronze hermaphroditic self-copulating dwarf — with paws of a lion, the tail of a fish, and a 1.8 metre wing-span, perched on a globe emerging from a lotus — was an image that arrived full-blown while I was standing on a subway platform without the aid of any sacrament. Gaia, one of my most popular images, occurred to me in the hospital while holding our daughter on her first day of life. Rowena: We are very interested in Entheon. Tell us a bit about the project — the inspiration and the concept. Alex: Allyson and I, having shared a studio for over forty years, have three bodies of work: Allyson’s paintings and sculpture, influenced by messages received in the psychedelic state; my paintings and sculpture; and Chapel of Sacred Mirrors (CoSM), our ‘social sculpture’ that we are creating in collaboration with our community. Allyson inspired and named the Sacred Mirrors series. She envisioned it and told me to create the series. We allow ourselves to be influenced and guided by each other, and to see through each other’s eyes for the good of the artwork. Entheon will be CoSM’s Sanctuary of Visionary Art. The word ‘theo’ refers to God. The suffix ‘en’ points to ‘within’. Entheon means ‘a place to discover God within’. In 1985, on our first dose of MDMA (E, ecstasy, Molly…) we lay on our bed with blindfolds on and simultaneously had a vision of the Chapel of Sacred Mirrors. For over a decade, we spoke to many individuals and groups about the value a temple might have as a pilgrimage site and destination for the ‘Love Tribe’. Entheon is under construction now at CoSM in upstate New York, and new technologies are making it possible. The ornamental sculptural building can miraculously be 3D printed, molds made and then cast in glass reinforced concrete. The dome of the Pantheon in Rome in 125 AD was cast in concrete, so there is a venerable tradition of this material in temples that have lasted over a thousand years. 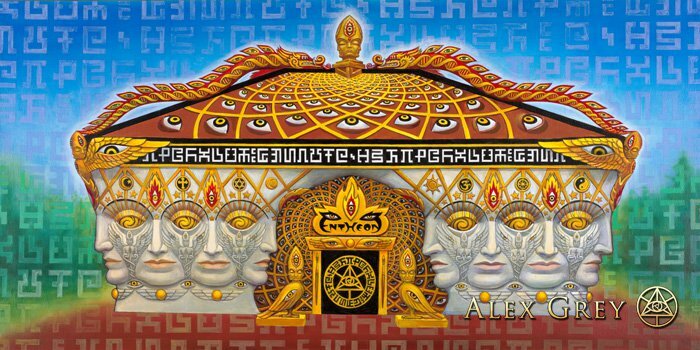 The most well-loved originals of Alex Grey, Allyson Grey and other highly accomplished Visionary artists will have a safe, acclimatized sacred context to preserve and share these precious and powerful originals with the global community. Rowena: Is it particularly envisioned as a site of pilgrimage, and how might this type of pilgrimage be similar to or differ from conventional forms? Alex: The greatest sacred sites have influenced us to offer our sacred art to the public for inspiration. Chartres Cathedral, initiating the European cathedral movement and built around 800 years ago, was the work of a community. The Cathedral contains a reliquary for the garment worn by Mary when she gave birth to Jesus. CoSM is already a pilgrimage site, visited by tens of thousands when we were in New York City from 2004-2009 and since we arrived in the Hudson Valley, six years ago. With the temple is built, the Sacred Mirrors and the entire collection will be on view as it was at CoSM, our Visionary Art centre in NYC. With my most-requested works of art available for contemplation joined by the most exquisite original examples of contemporary Visionary Art, the pilgrimage experience could be a catalyst for souls aligning with the divine, reclaiming a creative spark, and even uplifting a beleaguered world. Entheon will house many psychedelic relics including the ashes of Tim Leary and the glasses of Dr. Albert Hofmann, the doctor who discovered LSD. Rowena: Does the site in the Hudson Valley itself have a particular significance? Alex: CoSM is a 40-acre retreat centre where guests can stay overnight in the ten bedroom ‘Visionary Victorian’ and enjoy celestial events: full moon ceremonies, equinoxes and solstices, plus ‘Art Church’, where we make art together as a spiritual path. The Hudson River School is the first art movement in America and is considered a nature-honouring spiritual art form. Spiritualism originated there in the 19th century. CoSM is located in a tranquil setting just 105 kilometre from New York City, a highly popular ‘pilgrimage’ spot. Offering easy access from Grand Central Station, this woodland setting offers a ‘Wisdom Trail’, a sense of enclosure in the woods that includes many natural features and sculptural enhancements. The attraction of celestial events has supported CoSM, which became a recognised interfaith church in 2008. To serve our community, CoSM offers weddings, baby blessings and memorials in addition to regular programmes of a cultural and artistic nature such as workshops, lectures and meditation. Rowena: How does the physical design of the structure and the operation of CoSM offer particular kinds of experiences? Alex: Creativity and spirituality is the foundation of CoSM offering. At Art Church, we make art together in meditation with music. Then we examine art and life from a perspective or higher consciousness and conscience. CoSM has offered an unbroken chain of Full Moon Ceremonies for over 13 years. The Full Moon Ceremony has been referred to as a “spiritual variety show,” 10-minute segments of music, poetry, wisdom, blessings, declarations and surprises. Ceremonies are held with fire in the fireplace, beautiful altars and candle light, calling in a homey, familial atmosphere. Electronic music and ecstatic dance has become part of worship at CoSM, and never more than at the Equinox and Solstice Celebrations, as well as our annual Deities & Demons Masquerade Ball around Halloween (late October). 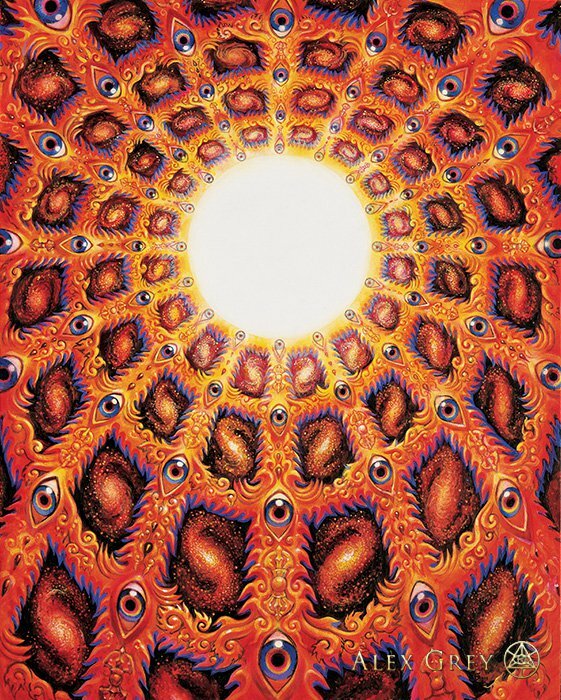 Visionary Art plays a powerful role in what CoSM offers the world. Dozens of some of finest visionary artists who portray the mystical experiences in their artwork offer this new kind of spiritual art to this radially welcoming, transdenominational interfaith church in-residence mural in The Cafe. Rowena: The Kickstarter Campaign for Entheon raised US $210,127, making it the second most highly funded art project in Kickstarter history. Why do you think so many people supported this campaign? Alex: Humanity hungers for a righteous task. Building a temple as an expression of the spiritual life of a community is such a task. Rowena: What type of traveller is the Entheon likely to attract and when will it be open to the public? Alex: CoSM welcomes and celebrates all paths to the divine. We are seeing cross-cultural and international guests embracing the message and art of CoSM. Artists of all disciplines and styles are coming together to proclaim creativity in service of love as their spiritual life, even their religion. The word religion comes from ‘religio’ or ‘to tie back.’ Through creative means, CoSMonauts are linking back to the Divine Source of all Creation. We would love to leave you with a ‘fun’ question. Best destination to take a ‘trip’? Yes, there is indeed a double meaning in this question. There’s no place like home. The kingdom of heaven experience is within. That is your ultimate destination. CoSM is our favorite home that we recommend it as a home away from home.